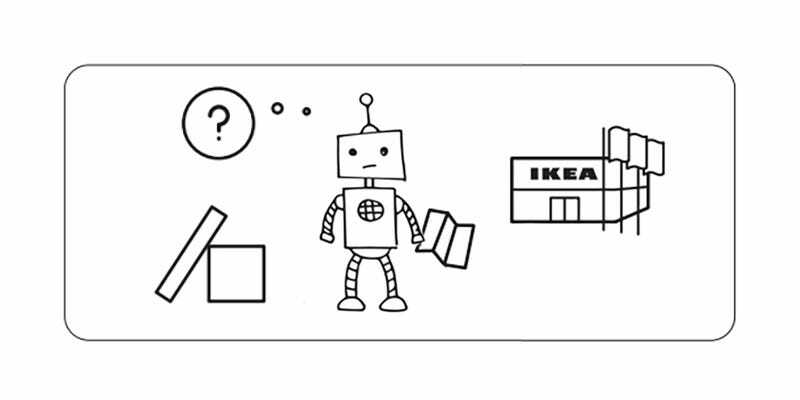 Folks have been fantasizing for years about the possibility of an Ikea-savvy robot. If Ikea uses robots to flat pack its furniture, surely we humans could use robots to assemble it! But despite at least a decade of attempts, one thing remains clear: Robots are terrible at building Ikea furniture. The latest attempt at the Ikea furniture-building robot comes from Singapore. A couple of researchers at the Nanyang Technological University are developing robots that can handle tasks in messy environments. (Think: What happens when you open an Ikea box and dump everything on the floor.) The researchers decided to test their robots by making them assemble Ikea chairs. Broadly speaking, robots excel at simple, linear tasks. Building a piece of Ikea furniture, however, is hardly that. It involves hunting for pieces and then hunting for the places those pieces need to go, while trying to hold the half-assembled piece together. Humans have a hard enough time doing this, but our brains are also hardwired for improvisation while problem-solving and our hands have no trouble putting little pegs in little holes. Robots, on the other hand, have a very hard time. A newly published paper called A Framework for Fine Robotic Assembly outlines how the researchers overcame the peg-in-hole problem. In brief, the assembly of an Ikea piece requires placing dowels into small holes, a task that tests the robotic vision system’s limit of positional accuracy. Both the dowel and the hole are tiny and hard to see, so the Nanyang researchers enabled the robot to “feel” the pieces. Fitting them together is even harder, but the researchers figured out that a pre-programmed series of motions that essentially amount to a system of trial-and-error would ultimately succeed. It’s not very graceful, though. Believe it or not, this is about as good as it gets in terms of Ikea furniture-assembling robots. MIT’s IkeaBot is a close second. The autonomous KUKA robots wowed audiences at the 2013 IEEE International Conference on Robotics and Automation by assembling a Lack table. As impressive as that is, it’s worth noting that the Lack table is a very easy piece of furniture to put together. Or at least it’s a less complicated game of Lego than the chair that the researchers in Singapore taught its robot to build. So if you’re looking for a bot that can just whip together your Malm dresser, you’re out of luck. Robots are getting better by the year. However, it’ll be a few more before a robot that can do your chores for you arrives.